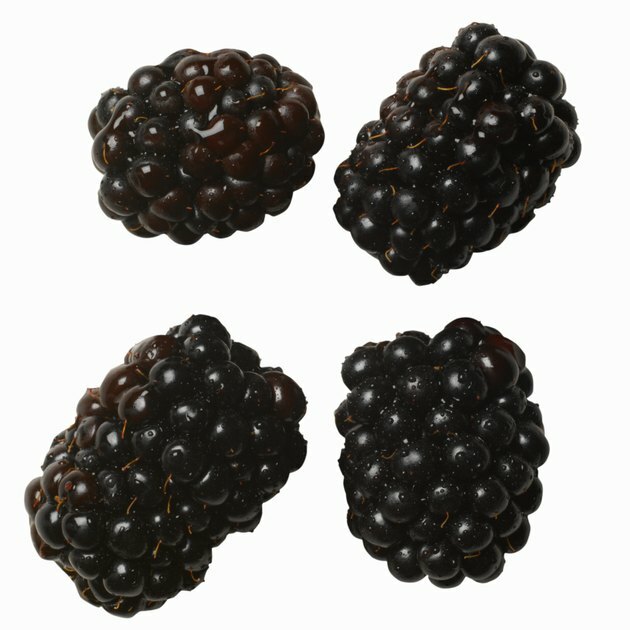 Blackberries are small fruits composed of tiny pockets called drupelets, according to the textbook "Biology: Life on Earth with Physiology." Like raspberries, they are not true berries and are called aggregate fruits. They contain large quantities of fiber, vitamin C and other important nutrients. As long as blackberries are clean, fresh and free of pesticides, they are safe for pregnant women. Blackberries are safe during pregnancy, as long as pregnant women take normal food safety precautions. Wash blackberries before eating them and avoid picking berries from bushes unless you grew the bush yourself. Pesticides and fertilizers used on blackberries can increase the risk of birth defects, according to neurologist Lise Eliot, but when blackberries are properly washed there is no risk. Avoid eating stale berries, which tend to shrivel or develop mold. These can cause abdominal pain and food poisoning. Blackberries provide several important nutrients and vitamins that can contribute to a healthy pregnancy. They contain approximately 21 percent of the recommended daily allowance of fiber, according to "Biology: Life on Earth with Physiology." Fiber contributes to overall health and well being and can help with constipation. They also contain about 10 percent of the recommended daily allowance of folate. Folate is of particular importance for pregnant women, because it helps prevent several birth defects and decreases the rate of miscarriage, according to Eliot. Other important nutrients in blackberries include vitamin C, vitamin K and potassium. Pregnant women frequently feel sluggish, especially late in pregnancy. Fruits such as blackberries are an important source of energy. Pediatrician William Sears recommends that pregnant women eat five to six servings of fresh fruits daily. Fruit increases energy, is low in fat and sodium and can aid in fetal brain development. Pregnant women often feel confused by the dizzying array of things to avoid. Generally speaking, there are only a few foods women should avoid during pregnancy. These include soft cheeses, deli meats, raw eggs and alcohol. While eating fish once a week is fine, large quantities of some fish, particularly tuna and salmon, can expose a developing fetus to mercury. Consult your physician for further dietary recommendations. Biology: Life on Earth with Physiology: Gerald Audesirk et al. The Portable Pediatrician: William Sears, M.D. et al.